You are special, so treat yourself like the queen you are and purchase one of our gorgeous statement tiaras. Show the world how fabulous you are, when you step out with your friends in these amazing bachelorette tiaras. Crown yourself with this tiara headband, whether you wear it as a bridal tiara or pageant tiara. It’s crafted in rhodium plated metal and garnished with clear crystals and 5mm white glass pearls. Diameter of the band is about 15cm. Width of the central section is about 25mm. Ladies treat yourself and your bffs to a fantastic night out with one of these silver tiara crowns. 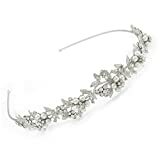 This entry was posted in Wedding Store and tagged Bridal, Clear, Crystal, Flowers, Glass, Headband, Leaves, Plated, Prom, Rhodium, Tiara, Wedding, White by Formal Affair. Bookmark the permalink.